Snowfall is an integral part of the global hydrological cycle. Even at low latitudes, much of the precipitation originates as snow crystals in the atmosphere. Some aspects of snow hydrology are discussed in chapter 4. With respect to the global hydrological cycle, one of the main effects of snow cover is to temporarily store water on the continents and on sea ice, delaying its return to the ocean by weeks to months. In the case of glaciers and ice sheets, water can be locked up on the continents for years to millennia. In snow melt-dominated hydrologi-cal catchments, peak river flows occur during the spring freshet, when runoff from snow melt reaches its maximum. Glacier meltwater supplements this in late summer and during the dry season(s) in the tropics. Lakes and oceans affect regional climate in several ways. Open water in winter months provides a source of longwave and sensible heat fluxes, moderating the climate of coastal areas and in locations next to major lakes. This effect vanishes once sea or lake ice takes hold for the winter. Open water also provides a source of moisture, increasing the snowfall in downwind areas. This effect is well documented in the Great Lakes area of North America, in coastal ice caps adjacent to the North Water polynya in Baffin Bay, and in southeastern Greenland. Warmer temperatures and loss of sea ice are expected to increase atmospheric moisture and snowfall at high latitudes. This creates a climate-change feedback that makes the system unpredictable. Increased snowfall has a positive influence on glacier mass balance, a negative impact on permafrost thickness, and mixed effects on lake and sea-ice thickness, depending on the seasonality of snow cover. A deeper snowpack in the winter insulates the ice and limits its growth, giving a thinner ice pack. 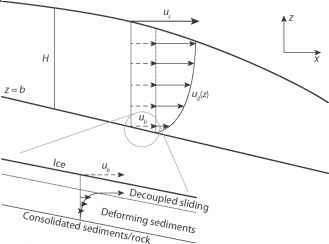 The formation of snow ice, through snowpack loading and submergence, has opposite effects on ice thickness. Spring and summer snowfall on lake ice, sea ice, and glaciers also promotes thicker ice, as the increased albedo helps to limit melting.